Kombucha. It is sold next to sport drinks in the grocery store and I’ve heard its mixture has medicinal qualities, is a probiotic, and contains sugar, alcohol, and scoby. When my kids are on antibiotic, the pediatrician suggests to put them on probiotic tablets to eliminate adverse effects on their tummies. I wonder if it is an acceptable replacement, but I don’t know how much sugar and alcohol are in it. 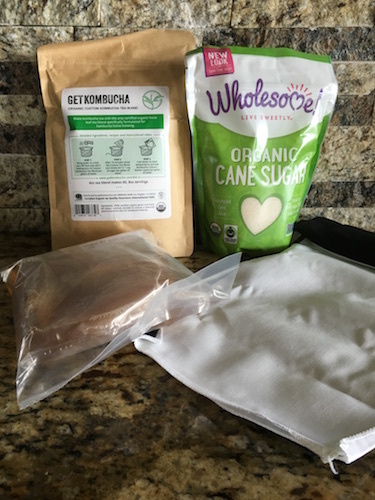 I don’t believe kombucha is going to cure the body of anything, but health advocates suggest it eliminates toxins, naturally bringing the body back to a healthy state where it can repair itself. “It is time”. to find out what goes into making it and why it is beneficial. At home we sometimes call it kom “brew” cha. I’m usually brewing something in the kitchen. Sometimes it is a science experiment, but there’s a lot of science behind this brew. What is it about that funny named tea that has so many people talking? It retails for between $3-$4 per 16 ounce bottle. I drink it occasionally and it causes me to wonder what about it is so healthy, and if can I make it at home cheaper. 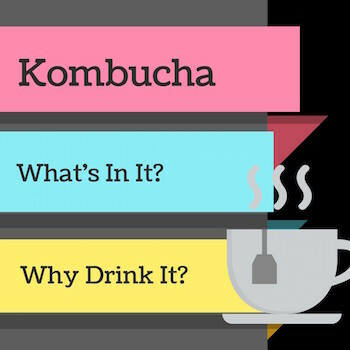 In a nutshell, it is a fermented drink: a blend of black or green tea, sugar, and scoby. 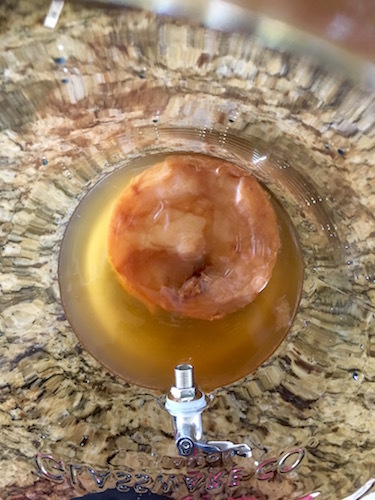 Scoby is a symbiotic culture of bacteria and yeast. It looks strange, and can be offputting in appearance, but is necessary for the fermenting process. It may have come from an Ancient Chinese around 212 BC, and the concoction of mushroom and fermented yeast concoction was used for immortality. As trade routes expanded to India and Russia, the fermented tea grew in popularity. Perhaps Dr. Kombu, a Korean physician, introduced it in Japan, and became the genesis of the name we call it today. Russian peasants used it near Moscow as a cure for cancer. It’s origin carries some mystique, and it has probably been around thousands of years. Today it is popular among health enthusiasts as an elixir of life with healing properties. Joint care: It is noted for lessening Fibromyalgia symptoms and athletes. Cancer Prevention: This is of dispute. Here are testimonies. It can’t be patented because it is never the same. There’s a little magic in the science of the brew that makes each cycle unique. Regardless some properties hold true about the brewing process. It contains sugar: How much sugar in the end product depends on how long the brew is allowed to ferment. The shorter the fermenting process, the sweeter the brew. The longer the brew, the more sour it will taste. Some brewing enthusiasts suggest as short as 4 days, depending on temperature and humidity. Although a full brew can go 30 days, no one suggests brewing that long because of the strong sour or vinegar taste. Those that brew a full 30 days, they usually add juice as a sweeter befo re bottling. It contains alcohol: It contains alcohol, but a very small amount. The Tobacco Tax and Trade Bureau says an item can be sold as non-alcoholic if it has less than .5% alcohol. I don’t have to present my ID at the checkout, and the clerk doesn’t ask me my birthdate. We’re back to the opening question of whether or not it can be used as a probiotic for kids. Since I live in the state of Texas I could give it to my kids as a probiotic replacement. In the olden days kids were given whiskey when teething, and I am sure nobody wants CPS knocking on their door. State laws vary, so use your best judgment when considering this option. and I wanted to make sure I had good tools. 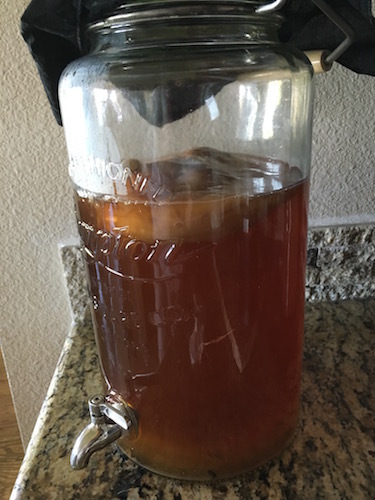 I brewed 5 tablespoons of tea, and added the appropriate amount of sugar for a 2.5 gallon container brew. After it cooled to room temperature I added the scoby, and covered the top with cheesecloth because the scoby needs to breathe.
. They will all work. No longer do I buy kombucha, but I do purchase loose tea. Regular black tea off the supermarket shelf works too. Less popular is using green tea, but either will work. If you don’t have scoby Amazon will deliver one to your front door. Or, you can buy a couple of already made kombucha. With enough time, usually about a week, it will produce its own scoby. This is a live bacteria. The scoby will reproduce. After about a month the mother scoby will start to die, but that is okay because there will be a baby scoby underneath. Touch the scoby as little as possible, never, if that’s realistic. I touched my scoby once when I had to separate Momma Scoby from the baby. It is slimy, and kind of gross. Momma deflated and the baby fell out. I tossed Momma in the nearest trashcan. Here is Dr. Axe’s recipe if you would like to make your own. It accompanies the reasons he is a proponent of the tea. Reasons not to partake of kombucha. Cautions for at home brewers. My own disclaimer: Now that I have made my own kombucha we drink it less often. The process is an eye opening experience. Nicole Akers is a Writer, Content Writer, and Blogger who cares about health. Check out her writing at: http://www.wetalkhealthy.com/ and be a part of the conversation in the Facebook community where a community engages on healthy topics. Hey Nicole, interesting post – I’ve been thinking about brewing some kombucha for a while now, just haven’t gotten round to it yet. One comment on the post, your final disclaimer is not so helpful, it just leaves more questions; _why_ do you drink it less often and what is so “eye opening” about brewing it? The SCOBY is unappealing to look at, but I am okay with that. Honestly, the day I touched the SCOBY it made a pop and it deflated as the baby fell out, and it almost turned my stomach. Even my 10 yo daughter who loves Science was grossed out. She wanted to touch it, then wanted to never drink it again. We have all come back around a bit, and enjoy it a little more leisurely, but not as much as before we knew how to make it. It does have some nice benefits that we just can’t bring ourselves to avoid. I hope this helps. Please let us know if you decide to brew your own, and good luck doing so, if that is your choice. I am interested in the answer to Chris’ question! I would like to try making my own Kombucha and this has piqued my interest again. I strongly believe in probiotics and frequently use non processed sauerkraut for that very reason.